Over the course of Sweden’s modern history, the Wallenberg Family has been involved in finance, entrepreneurship and philanthropic activities to promote and advance industry, services and globalization. The family’s history all began with André Oscar Wallenberg (1816-1886), who decided to leave his career as a naval officer to capitalize on the new wave of entrepreneurship that he had witnessed evolving in other countries. The family’s history all began with André Oscar Wallenberg (1816-1886), who decided to leave his career as a naval officer at the age of 30 to capitalize on the new wave of entrepreneurship that he had witnessed evolving in other countries. This was at a time when new limited liability corporations were replacing traditional Swedish factories and trading houses. It was also an age when the Swedish railroad network was being built with foreign financing. SEB participated successfully in all these developments. But during the major international structural crisis that prevailed for several decades, until 1896, the Swedish bank was dragged down when the economy took a sharp downturn. On several occasions, the bank was faced with the choice of either declaring bankruptcy for the companies it had outstanding loans for, or to become more actively involved in the companies to get them back on their feet. In several cases – Atlas Copco is an example – the bank decided on the latter course and also become a major shareholder in the companies. After that, the bank became an owner of companies and not just a lender. The foundation was laid for the business that later became Investor AB. This experience would permeate the Wallenberg family’s view of consolidation and risk-taking for a long time. During this period, André Oscar had become the principal owner of the bank and his son, Knut Agathon (1853-1938), had just joined the bank. The heir soon became a skilled operator in the international capital market and managed to use his entrepreneurial talent to build up a sizable fortune for the bank and privately during his long management career. Knut Agathon also wrote editorial pieces for Dagens Nyheter (DN), a Swedish daily newspaper, and was actively involved in the public debate. Because he and his wife Alice were childless, he donated considerable sums of money for construction projects in Stockholm and founded the Knut and Alice Wallenberg Foundation, which remains one of the cornerstones for all activities revolving around the family. The Foundation’s statutes state that donations are to be made for the betterment of Sweden. The family’s base became firmly anchored in Sweden, as it still is today, but with the world as its constant workplace. During World War I, Knut Agathon served as Sweden’s Minister for Foreign Affairs with the clear objective to prevent Sweden from supporting Germany. His half-brother Marcus (1864-1943) joined the bank's management. Marcus had a law degree and the title of District Judge. He eventually succeeded Knut Agathon in 1911. With an industrious and enterprising person to help him, Knut Agathon and the bank were given the opportunity to restructure industry during the new age of engineering, electricity and chemistry. Marcus helped pilot companies like Asea, Norsk Hydro, Atlas Diesel, Papyrus, Stora Kopparberg, Separator and Scania-Vabis through crises and successes. After World War I, he became Europe's leading negotiator and arbitrator for many different international projects that would normalize the economy. Investor AB was founded in 1916 after the introduction of a new Swedish law that would make it difficult for banks to become long-term owners of shares in industrial enterprises. Shares held by the family’s bank, SEB, were transferred to the newly started Investor AB holding company. Marcus had two sons: Jacob (1892-1980) and Marcus (1899-1982). In 1927, Jacob took over the main responsibility for managing the bank after the death of Josef Nachmanson. In 1920, Nachmanson had succeeded Marcus, the “District Judge”, as CEO of the bank. He was also a confidant of the family who schooled the two brothers in day-to-day business. Although Jacob's career would be marked by the severe deflationary crisis that prevailed in Sweden, he learned how to act boldly in the international financial market. Jacob’s father Marcus was constantly his sounding board and he was involved in decisions until his death. Like his uncle, Knut Agathon, Jacob built up a considerable fortune for the bank by maintaining a cautious dividend policy and through strong consolidation. The bank’s deposits were largely allocated and utilized for the Wallenberg sphere’s own projects and SEB eventually became more like a commercial bank or venture capital firm. But the Swedish authorities forced SEB to draw a boundary line between the bank and the business operations of its two holding companies, Investor and Providentia. Marc Jr (1924-1971), son of Marcus Wallenberg, took over the leadership of the bank in 1958 when his father started to focus more and more of his energy on major corporations in which Investor and Providentia had a controlling interest. With the family bank wealthy but stagnating, Marc set out to put the bank on more equal footing with its client companies and negotiated a merger with competitor banks. His father’s choice fell on Skandinaviska Banken, the largest in Sweden in terms of business volume. When Marc died in 1971, his younger brother Peter (1926-2015) was summoned. Peter had chosen to pursue a career within Atlas Copco and in 1982, after the decease of Marcus Wallenberg, a new era began with Peter having sole responsibility for the sphere during a phase when the family’s power over the new merged bank, Skandinaviska Enskilda Banken, had declined. A series of devaluations of the Swedish krona paved the way for a bull market for the Stockholm Stock Exchange after half a century of stagnation. Peter now had the opportunity to regain lost ground through Investor and Providentia. Major structural changes were carried out within Electrolux, ABB and Stora Kopparberg, among other companies. Astra developed the most attractive pharmaceutical in the world – Losec for treating gastric ulcers – and Ericsson made a revolutionary breakthrough in the mobile telecommunications industry. In the fall of 1992, the value of Swedish krona declined approximately 25 percent. Sweden experienced a real estate crisis and recession that was almost disastrous for the bank. During this turbulent period, Investor strengthened its ownership positions and operations were later put back on their feet as a result of intensive efforts. In 1994, the private equity firm EQT was started with Investor as one of its founders. Investor has also been a sponsor of EQT’s funds ever since. All curves were trending upwards when Peter, by virtue of his age, exercised his right to step down from active management and handed over the chairmanship of the new Investor AB, which had taken over the other holding companies in the sphere, to Percy Barnevik, CEO of ABB, in 1997. Jacob (1956-) and Marcus (1956-) took over responsibility for the sphere at the turn of the millennium. Jacob is Peter’s son and Marcus is Marc Jr’s son. Peter’s second son, Peter Jr (1959-), also became involved in the family business. Today, these three representatives from the fifth generation hold the positions of Chairman in SEB, Investor AB, Patricia Industries, FAM AB and the Wallenberg Foundations. The Wallenberg sphere emerged strong from the global financial crisis in 2008. Today, the goal is the same as it was for the family’s founders – to continue to create solid returns for the Wallenberg Foundations without compromising the need to build new companies that are economically sound and capable of operating long-term, which can generate revenue for managing the family’s future business. For the first time in the family’s history, representatives from the female side have also joined the boards of the Foundations – the sisters Caroline Ankarcrona and Mariana Risberg and their cousin Andrea Gandet. A program has been carried over the past few years to give family members of the sixth generation the opportunity to learn more about the family’s activities and increase their involvement over time. 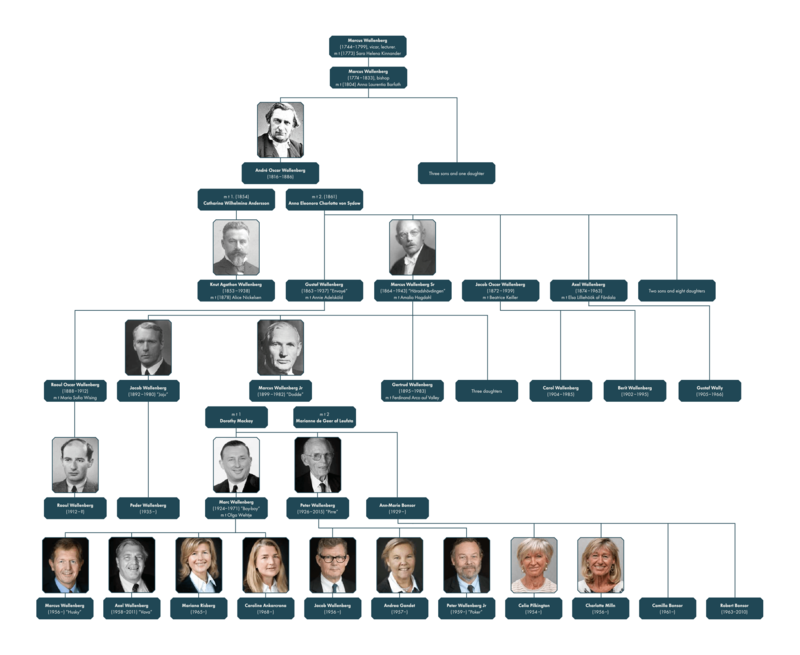 About ten members of the family from the sixth generation are currently serving as deputy members of the boards of the Wallenberg Foundations or are working in companies associated with the family. For 160 years, members of the Wallenberg family have been involved in family-related businesses. A number of books have been written about members of the Wallenberg family. Some have been financed partly or completely by The Foundation for Economic History Research within Banking and Enterprise. The Foundation has approximately 2,000 running meters of records and documents, of which most originate from Stockholms Enskilda Bank (1856-1971). The Knut and Alice Wallenberg Foundation is Sweden’s largest private funder of research. The Foundation was established in 1917 and its aim is to benefit Sweden by supporting Swedish basic research, mainly in medicine, technology and the natural sciences. The publishing house Bokförlaget Max Ström was commissioned to produce this book on behalf of the Knut and Alice Wallenberg Foundation to mark the Foundation’s 100th anniversary in 2017. A great many people from the Foundation and elsewhere have made valuable contributions to the content of this book. 2016 marked the 100th anniversary of Investor AB. In conjunction with the anniversary, Investor published a book about the people, the companies and transactions, the events and the environment that contributed to shape Investor during its first 100 years. The book, written by the author and journalist Ronald Fagerfjäll, is based on interviews with many key individuals within Investor and its network. A book about Peter Wallenberg. Only available in Swedish. Marcus Wallenberg was the most notable representative of Sweden’s industrial tradition during the 20th century. He was active from the 1930s until the 1970s, during the period when the Swedish welfare state was being created. After the Second World War, he assumed responsibility for Stockholms Enskilda Bank, the Bank that, more than any other, functioned as financer and the center for new business enterprise within Swedish industry. “Furthering a Fortune” is, first and foremost, an account of a life’s work. The question is, however, whether it is all possible to portray a person’s life in isolation from his or her profession. In the case of Marcus Wallenberg, it is quite through his practical actions that one comes closer to him. At Number 12 Kocksgatan, a little red cottage with white-painted corners in the south of Stockholm, a boy was born in May 1853. Knut Agathon was officially born out of wedlock, but in reality, was a member of a stable family. His father, AO Wallenberg, founder, among other things, of Stockholms Enskilda Bank, was an ambitious man and Knut’s future path was marked out for him at an early stage: boarding school, so that “he be brought up as God-fearing, upright and honest”; thereafter, training to become a naval officer, enrollment in a commercial academy, internship at Crédit Lyonnais in Paris, promotion to managing director at 33, and 25 years later, elevation to chairman of the family bank. It was he who would nurse the bank back to financial health, following a serious crisis in 1878-1879, and create the unique Wallenberg tradition. André Oscar Wallenberg (1816-1886) was a Renaissance man who found himself in the wrong century. Already as a young teenager, this bishop’s son from Linköping, Sweden, went to sea in order to meet a new world in the United States. As a naval officer, AOW later trained himself in "the young navy" as a politician and a banker. Then, in 1851, he left the straitjacket of his naval career to become a wholesale merchant and to live for the concept of banking as an idea. In the world of banking, Wallenberg set about modernizing the old-fashioned Swedish system of credit along the lines of well-proven Scottish practices, while improving those practices in various ways. The founding of Stockholms Enskilda Bank (SEB) in 1856 was of crucial significance and provided an important model for other Swedish banks. But AOW was also able to rely on his extensive contributions to Swedish journalism, his rapid rise as the leader of the powerful liberal faction in the Estate of the Burghers within the nation’s four-chamber Riksdag, and his good relations with Finance Minister J.A. Gripenstedt. Once new banking legislation that he had championed was enacted in 1864 and 1874, AOW was satisfied that he had established “the world's best banking system”. In 1878-1879, however, both this system and the now Wallenberg family-dominated SEB found themselves in a deep crisis following a number of all too bold investments in railroads, iron foundries, and sawmill operations. This crisis brought a close to AOW’s grand career as a leading financier, politician and journalist during Sweden's liberal breakthrough, but, paradoxically, it marked the beginning of a new era of triumph for the Wallenberg family as a whole. The family had not initially welcomed the close cooperation between the bank and the large manufacturing firms it controlled, but it was precisely this cooperation that would provide the Wallenbergs with both profits and power in the future. For his part, AOW had laid a strong foundation for this future thanks to the very purposeful family policy that he and his wife Anna pursued so single-mindedly. This book about the Wallenberg financial dynasty, titled “The story of Gertrud “Calle” Wallenberg. Mannerheim’s last love”, is different from the many biographies that have been written about the family. Gertrud (1895-1983) was the daughter of Marcus and Amalia Wallenberg and a relatively unknown woman. The book describes the family’s position in Swedish society, and relationships between family members, from her point of view. As we read about the story of Gertrud’s life, the destiny of Calle’s three sisters is also described, giving the reader an idea of the social conditions for women in the Swedish upper class at the beginning of the last century. Gertrud Calle Wallenberg was a fearless and headstrong person who chose her own life path in a Europe characterized by the wars and crises of the 1900s. Jacob Wallenberg’s life is a slice of 20th century history. During his 88-year lifespan, Sweden and the entire world changed drastically in almost every respect: in terms of economic structure, political system, social organization and media. Håkan Lindgren’s recounting of Jacob Wallenberg’s life emphasizes the human aspects of his being in an attempt to explain what molded Jacob as an individual. The author also details Jacob Wallenberg’s professional career; his contributions to strengthening the family’s position in the Swedish business world and augmenting its fortune, as well as his efforts as an international negotiator, both before and during World War II. Newly obtained source material from Russian and German archives is used to cast additional light on both his private business dealings and Sweden’s relations with Germany. For example, the author provides new insights into the much-discussed Bosch Affair and presents new material about Jacob Wallenberg’s contacts with the German resistance movement. In “Wallenberg – The Family that Shaped Sweden’s Economy”, Gunnar Wetterberg traces the history of an outstanding Swedish family. He tells of political complications and financial brainwaves and presents the family’s leading men and their feuds. Wetterberg relates the history of the Wallenbergs as a financial dynasty, intertwined with Sweden’s development into a modern industrial nation. In no other country has a single family had such a strong and multi-facetted position for so many years.